When did you begin doing dog agility? 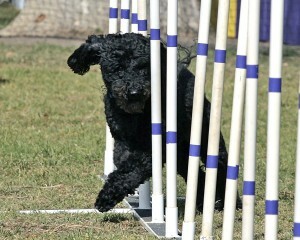 We probably started taking agility classes for fun in 2005 and competed for the first time in 2006. How did you get interested in and doing dog agility? I signed up to take a “Sampler Class” to sample all the different classes being offered at Jump Start Dog Sports in Yorba Linda, CA. The Agility was so much fun and such a challenge that we just continued on with it. We began just for fun but soon it became apparent that “we were hooked”. What type of dogs do you have that do agility? I have Puli’s (Hungarian Sheep Dogs). The actual plural of Puli is Pulik. I have a boy named Buvi who is 10 years old and still running very competitively in his 16″ category. The dogs are divided up by their height at the shoulders and that determines what jump height they compete in. I also have a young 3-year-old girl (Dixie) who is just beginning her career in agility. What kind of training is required and how often? Where do you train? If you ask 10 different people, you will likely get 10 different answers. I also train and compete with my dogs in obedience; this is very helpful because if your dog is not reasonably obedient, it will be difficult to work with them on an agility course. I began this sport at retirement age and need as much help as I can get so we train a lot. Here is our schedule right now: 1-hour Agility Class on Monday with Dixie in Chino, CA (Peak Performance Dog Sports); 1-hour Obedience Class on Monday evening. with Dixie at Jump Start Dog Sports; 1-hour Agility Class on Tuesday morning with Buvi, followed by half-hour private agility lesson with Dixie in Chino; 1-hour private obedience lesson with Dixie followed by a 1-hour agility class with Dixie in Yorba Linda. 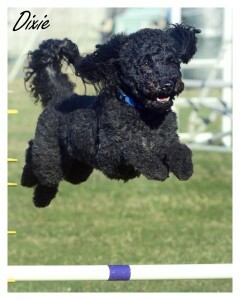 Most Fridays have a 1-hour “Jumping Grid Class” with Dixie at Wags & Wiggles in Tustin. We try to practice in between times and are trailing most weekends. Whew! 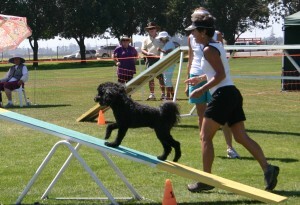 Most of the handlers I know do not have the space or the money to set up agility equipment in their yards. What type of positive reinforcements do you use with your dogs (treats)? I use, primarily, small pieces of hot dogs usually kept in my mouth and distributed from there……….I want my dogs to be looking up at me as much as possible. Toys are also used a lot; you will see a lot of agility dogs that place a very high value on tugging with a toy. I also use Turkey Meat Balls (from Trader Joe’s) as a “Jackpot” (reward) treat after running an agility course at a trial. String cheese is another favorite treat. How much time do you spend training and at events each week? I spend a lot of time training and competing…………7 class events each week and competing almost every weekend. Now that my young dog is competing it doubles everything! Last weekend we drove 85 miles in the pouring down rain to compete in Obedience……yes, we are pretty passionate about our dog sports. Do you have to travel a lot? Where are most of the events? We are very fortunate here in Southern California that we have Agility Trials almost every weekend without traveling too far. Some of the popular venues are: Brookside Equestrian Center in Walnut, Industry Hills Expo Center in Industry Hills, Woodley Park in Van Nuys, Navel Training Center in Point Loma, Brookside Park in Pasadena, Fair Grounds in Del Mar, L.A. Fair Grounds in Pomona, and various parks in Ventura and Camarillo, to name a few. How do you mentally and physically train for events? We have people with a wide array of physical abilities in Agility and that is what makes it so interesting. The dogs themselves have a wide variety of abilities. If you have a fast dog (I do), it is important that you keep up with him and actually be ahead of him in order to guide him thru the course. Memorizing the course can be challenging when you are trying to think about all your handling maneuvers and running…….it is very easy to forget the course in a split second “brain fade”. The courses for Excellent Dogs (the experienced dogs) will have about 20 obstacles and will generally be run in under a minute (30-60 seconds). The judges will establish a “Course Time” for each jump height and the team must run the course (without any errors) under that time in order to qualify. 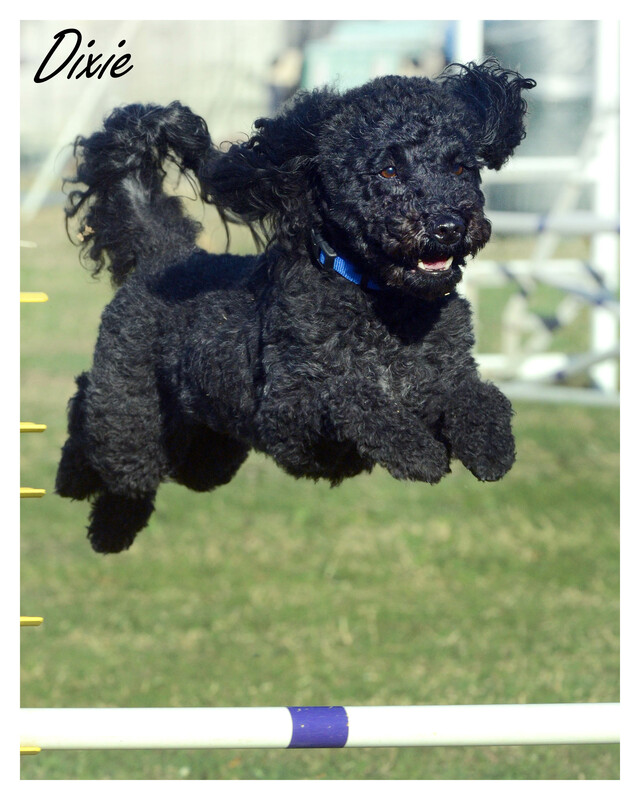 In AKC Agility, most of the dogs will compete in 2 different courses: Jumpers with Weaves and the Standard Course. Standard has all the obstacles: teeter, a-frame, dog walk, table, weave poles, tunnels, broad jump, triple jump, double jump and regular jumps. The JWW is usually faster and has only jumps, tunnels and weave poles. The courses are designed by the judges and are different every time. We must be allowed a minimum of 8 minutes to walk the course and memorize it………..usually we get more time than that. Can you speak about treatments that you or your dog receives to be in top physical condition, i.e. massage, acupuncture, etc.? Are there other treatments that are interesting to you but have not tried? My 10-year-old boy is in amazing condition and I do everything I can to keep him that way. Perhaps the most important thing I do for him is keep him lean. I also give him human joint supplements (glucosamine & chondroitin). He does get special massages from a Veterinarian-turned-massage therapist specifically for performance dogs……every six weeks or so. I have also used canine chiropractic and acupuncture for him. I would return to acupuncture if he begins to show any signs of pain. I also watch him like a hawk to look for any signs that he may have injured himself or pulled anything. As for me, I just try to stay upright and keep moving! We all love our dogs no matter how they perform! It is pretty important to enjoy being outdoors, regardless of the weather! I have found “Agility People” to be an exceptionally nice group of people who sincerely want to see everyone do well. We pretty much have it all: young and old, physically fit and physically challenged. For many competitors, their dogs are their families. What is the most rewarding part of doing agility with your dog? First is probably having this amazing relationship with your dog……a partnership like no other! I just read that you can have a world class handler and a world class dog but they may not do well together……….the key is knowing each other’s weaknesses and working together to do the best you can. I also love to watch all the other competitors and delight in their successes and console when needed. It is great to see how well some of the older dogs and older people can do and also to see all the young puppies coming along. We have some fantastic venues here in Southern California and have lots of fun too! What is your greatest challenge with agility? Timing!!!! 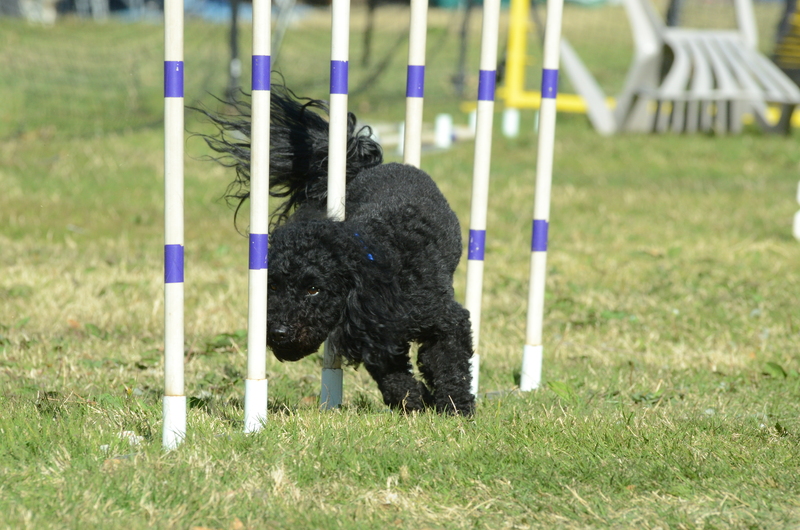 I don’t have near the experience that most of my friends do………many are working on their 3rd or 4th agility dog and I am on my first. It is my responsibility to show my dog where to go and when to turn ………most of this is done with “body language”. If your dog is fast, you must give the cues in a timely fashion or he will not follow the course correctly. Timing is everything, as it is in many sports! I am much better than I used to be, but remembering the course and my handling maneuvers can often be challenging. When having to turn around 360 degrees or 270 degrees, I often get disoriented and then lost on the course…….not good! I also still struggle a little bit with nerves……….mine and my dog’s. Do you feel that doing agility affects your relationship with your dog? How so? It definitely enhances our relationship……….we spend tons of time together training and practicing and then competing and he loves it!!! Now that I have 2 dogs competing, one gets pretty upset when the other gets to go “play”. Plus, I have learned so much valuable information about my dogs on this journey. How long do you think you will continue to do dog agility? As long as this body holds up to the task! Recently, there was an article in Clean Run about older handlers and 8 to 10 handlers were interviewed regarding their ages; all were in their 70s or 80s and I know most of them and they are going strong! If other dog owners are interested in doing dog agility, how would you suggest they get started? What breeds dominate the sport? Best age to start? I would suggest looking for a location that offers agility classes and then research (if there is more than one option). There are a lot of options here in Southern California depending on where you live. Google it in your area. Border Collies pretty much dominate the sport but most of us are not out there to become World Team Competitors……..just want to be good for us. The best time to start is as soon as the puppies have all their shots and can be out in the world. There are lots of puppy activities they can do until their little bones have formed enough for actual jumping. My advice is to be careful……….this is a very addictive activity!! !